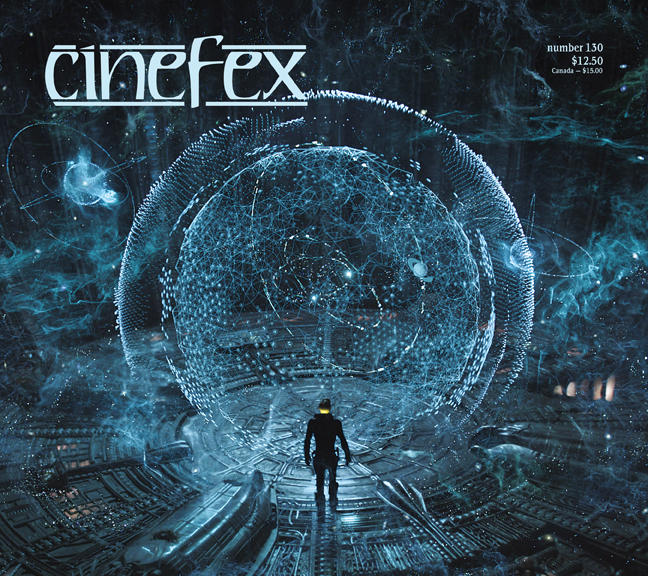 In the trailers for Prometheus we are introduced to a display of floating galaxies as if the chamber in the alien environment was designed as some sort of a planetarium what is known to be an Orrery. Much discussion has gone on about what this was supposed to represent. Soon in one trailer, David is seen to be holding a hologram of the planet Earth. Before the film was release, Jonathan Spaihts revealed through Twitter that this strange place was called "The Orrery"
Jon Spaihts: "From my notebook: Ridley's first sketch of the Orrery. In a conversation that Jonathan Spaihts and Ridley Scott were about about star maps and the story necessity for the navigation instrument that the viewers would see, Ridley started talking about a painting that he had in his mind, he could not remember the title but described it as "Circles in circles with a candle lit image." "Yes, that's the painting," exclaimed Ridley Scott "Scientist, scholars and children"
What they had done was made a leap from star map to an Enlightenment painting and then back into the far future. This was a very exciting moment for Jonathan Spaihts the self proclaimed "illuminatus" on Twitter (no! no! We're trying to get away from Illuminati conspiracies here) on the internet whatever that might mean, getting involved in this kind of interplay with Ridley Scott and the way his mind would leap from one level to another. 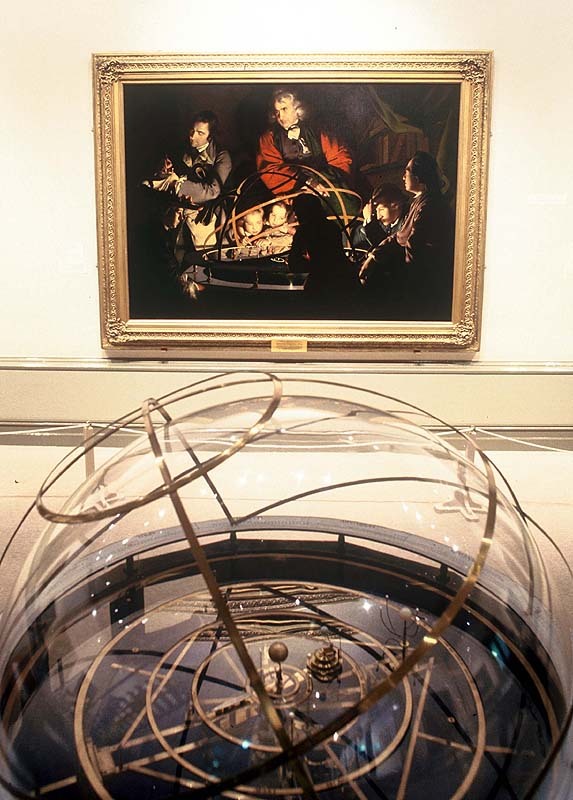 The orrery developed into something that according to an idea shared, contained a map of the entire universe. The big band at the center, and contained galaxies and nebula as points of light. 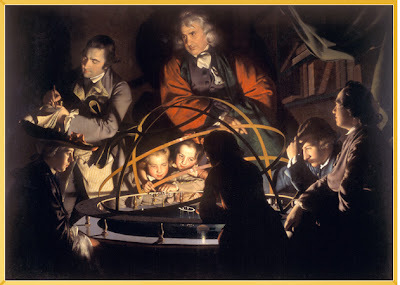 The Engineers studied stars by dragging spheres of data into the central area, and then expanded them until they held a planet in their hand. Rotating hoops had planets attached to them, and each ring contained data of genetic material for the species in that star system, each with its own little buts of alien language and DNA maps. "Here’s an example: if you’ve noticed a point in the Prometheus trailer when a 3D alien star map fills up a huge room, that owes its visual inspiration to a 1766 painting by Joseph Wright, called “A Philosopher Lecturing on the Orrery.” The painting is of a scientist showing a mechanical planetarium to a group of enthralled adults and children, and by dramatic candlelight. in his mind,” Spaihts remembered. “Circles in circles with a candle lit image,” Scott had said. Spaihts thought of the Wright painting and did a Google image search.